The Explorers Program encourages your two-year old to exert their new-found independence in a fun and active learning environment. We believe in focusing on the needs of the “whole child” in every program that we offer. The Explorer Program is designed to promote discovery and to give each child the very best start to a life-long love of learning. We implement appropriate practices through professional excellence, all in a caring environment. As the world opens up for exploration, we appreciate and value our role in these learning moments with each child and the partnership that is formed with the parents. Our teachers focus on each child and provide them with a consistent structured schedule that includes learning through class time, playtime, social interaction, and rest time throughout the school day. An understanding of values including honesty, compassion, and giving. An understanding of language through conversation and books. An understanding of math through puzzle and block play. An understanding of the feelings that signal he/she needs to use the bathroom. An agility in outdoor play and group activities. An understanding of cooperation through social interaction with classmates. The Apple Tree Academy curriculum is integrated into your child’s day utilizing the best trends in education that are based on brain research, all in a loving environment. Throughout the day, there is a balance of quiet and active periods. 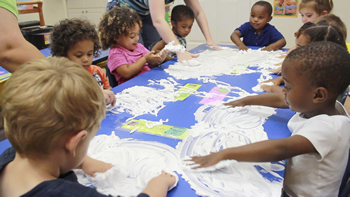 At Apple Tree Academy, we understand that every two-year old likes to be independent. Our nurturing teachers will guide your toddler in these critical developmental stages from the art of sharing to discovering answers to their favorite question, “Why?” Our teachers will guide and encourage with a gentle tone and unconditional love for every child. Our teachers provide the attention and guidance to assist children with potty training. We provide a daily schedule with the perfect balance of academics, playtime, social interaction, and rest time throughout the school day. At Apple Tree Academy we are excited to guide your Explorer in their quest to learn! The Adventurers Program is designed for your three year old to enjoy the discovery of life and learning in a fun and active environment. we believe in focusing on the needs of the “whole child” in every program that we offer. The Adventurer Program is designed to give each child the very best start to a life-long love of learning. We implement appropriate practices through professional excellence, all in a caring environment. As the world of learning unfolds for the child, we value our parents as partners on this important journey to the years of learning that lay ahead. Our programs are designed to include the perfect blend of class time, playtime, social interaction, and rest time – all designed to enhance the knowledge and love for learning in every child. To tell a story or gather information from books. To communicate through better listening and speaking skills. New words and build a vocabulary through word games and phonics instruction. To recognize numbers and basic math skills. The social skills and the importance of generosity, sharing, and thankfulness in the classroom and on the playground. The Apple Tree Academy curriculum is integrated into your child’s day utilizing the best trends in education that are based on brain research, all in a loving environment. Throughout the day, there is a balance of quiet, group play, and active periods. At Apple Tree Academy, we value your three-year-old's inquisitive nature and will guide and encourage with a gentle tone and unconditional love for every child. Your child will develop listening, speaking, reading and writing skills and build understanding and appreciation of reading as an added adventure in his world. Children develop cognitively, physically, social-emotionally, and creatively through fun, engaging activities. All programs are customized to your child’s progress, needs and age. At Apple Tree Academy our teachers look for innovative ways to increase the learning opportunities for each child.